COMPANION DRAGONS TALES: FINDING WAXY NOW AVAILABLE AS AN EBOOK! Pro Se Productions, a leader in Genre Fiction announces that its latest YoungPulp! 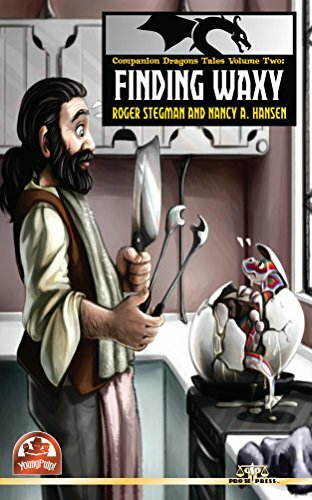 release - Roger Stegman and Nancy A. Hansen’s Companion Dragons Tales Volume Two: Finding Waxy - is now available as an ebook. Roger 'Rusty' Rustman is a very secretive fellow—and with good reason. He's not only an untrained wizard who uses forms of magic that are frowned upon, and trades in enchanted items that aren't exactly approved of; but he travels to dangerous places that other magical people avoid, and then writes about them anonymously. From his questionable recreational hobbies he has built a tidy second income along with a stockpile of magical resources. Over the years Rusty has gained a reputation as a shady character who operates on the fringes of the Wizards and Witches Council code of ethics while flaunting Wordsmith Guild regulations; but he's really just a quiet and modest writer mage who enjoys a bit of adventure now and then. The last thing Rusty needs is a small but very noticeable companion tagging along. Unfortunately, while on his latest trip out to the magical otherworlds, he finds a very large abandoned egg that decides to hatch unexpectedly in his vacation cabin. That begins an entirely bizarre and mystifying set of events that only the cooperation of a spunky and intelligent little rainbow colored dragon can get him out of safely. Featuring a wonderfully whimsical cover by Kathryn Frizzell, logo design by Sean Ali, and ebook formatting by Russ Anderson, Companion Dragons Tales Volume Two: Finding Waxy is available via Amazon for the Kindle and for most digital formats at www.smashwords.com for only $2.99.